It is my direct experience that Plant allies have two functions: the physical and the energetic function. The physical aspect communicates with our bodies, supporting it with nutrients, regulating hormones and stimulating or relaxing the nervous system, helping us to cope with our imbalances. The energetic aspect communicates with our Soul, our energy field and our connections with Spirit. I’m not scholarly nor a very good writer, so I do not offer you a list of reference or lengthy explanations. I’m reading my herbal books and online sources, communicating with the plants myself, and forming my own Herbarium of experiences. It is these experiences that I wish to share with you. Hawthorn is a dear ally to me, as it helps me to lift my blood pressure and soothe heart palpitations when ever they occur. It is a heart medicine, regulating blood pressure (lifting if low, lowering if too high) and strengthening the Heart. You can find plenty of descriptions about Hawthorn’s herbal medicine qualities in books and online – read a good selection of sources to get a well-informed understanding about her qualities! But today I would like to look deeper into the energetic aspects of Hawthorn. She typically stands at the edge of the woods, or in a hedgerow between fields. She is a ‘gatekeeper’, the watcher over boundaries. She is thorny, giving shelter to birds and small mammals from their predators. She is the protector. She stands in full blossom in May, and has plenty of berries in the autumn, marking the transition seasons, Spring and Autumn. Hawthorn has the reputation to be, together with Elder, the favourite tree or bush of fairies, elves and other etheral creatures. For me Hawthorn is the ideal Plant ally for protecting my personal boundaries and for transiting between our seemingly solid visible world and the etheral Spirit world. I go to her and use the berries in herbal tea for the energetic aspects, and as a tincture (blossom, leaves and berries) for the physical aspects. Why? Mostly because I feel that the alcohol in the tincture doesn’t rhyme very well with the aspects of Soul, and yet it does get the medicinal components out of the plant material and into the liquid so that they are more readily available for our physical body. So to conclude: whenever you feel you could use some stronger personal boundaries, seek Hawthorn and hang out with her, in any way that appeals to you. Visit her, drink her, think her. What brings you joy? So much that, at the thought of it, your heart makes a little leap of joy and you can’t wait to begin? Here’s my passionate, almost pressing advice: follow your joy, that interest that tickles you so deliciously. It will lead to true value and profit – it will bring you real happiness, meaningful connections and lasting value. As you’re happily skipping along the road of your inspiration, you’ll meet others who share your special kind of craziness. Cherish them, they are your tribe. Seeds and plants bring joy to me – well hello there, friends! Yes, I’m the crazy plant lady with a garden crammed full with plants in the ground, in pots, in the air and as seeds, overflowing my storage boxes for them. I invest in plants. When we moved here ten years ago, I dived head-on into gardening. As a complete beginner, I watched in awe the poppies and tomatoes taking over my little plot of land in the first season. Seeds germinated and grew into these fantastic beings! Since then I’ve changed my mind about “what my garden is about” a gazillion times. Every time I turn my idea around, I’m honing it, from “aesthetic” via “edible” and “healing” to “beeplants”. Currently it is all four of these. There is a deeper meaning to this play. Your passion contributes to a bigger picture. There is a social, spiritual and/or ecological aspect to it that helps our world evolve. Can you see your “hobby” as a seriously meaningful practice of healing this dear world of ours with your special flavour of passion? What if you’d bow in respect to your joyful Heart and commit to your happiness? Make your inspired practice your path = fulfillment and happiness. Plants are a promise of a greener future, in every sense of the words. I allow myself to get carried away with new ideas, as long as I tend to old acquintances. I’m a novice and an old soul master at the same time, depending on the depth of connection I have with what I’m doing. Time loses its meaning, seasons mark the rhythm of life. I’m gratefully raveling the beauty of green shapes and colourful flowers, the sweet and strange scents and tastes, and marveling the shapes of seeds and how they’re packed by nature. I do my best in “paying back” by tending the gardens, loving individual plants with my warm breath and keeping an eye on the wellbeing of these green companions. The knowledge and finetuning I acquire in the garden seep through into other areas in my life. Into the kitchen, where flavour, texture and colour bring nourishment and satisfaction to our bodies. Into the Gatherings – I love a deep, meaningful conversation with another, reflecting on our uniqueness and sameness as Souls on Earth at the same time. Onto the massage table, where pressure, touch, warm scented oil and skin – so many kinds of skin and bodies! – speak the language of chi, life force flowing through our world. Thank you, Mia, for pressing the “launch” button of this thought-rocket, and for Grytsje for laying the table for play. Some seeds, bulbs and dried herbs are now available! Sometimes I get on a thought-train that lasts for days. It all started at Instagram, when I was commenting on a post by @earthcarekitchen. She was inspiring us, the readers, to cook with what we already have in our kitchen, with the idea that limitations boost creativity (as they do). She also posed a question: what goes well with brown rice? I’m (almost) always cooking with ‘what the kitchen holds at this moment’ and enjoyed the familiar setting. Sparked by the question, I commented by sharing my tried and tested culinary path of brown rice: in my opinion rustic stuff rhymes well with brown rice – eggs, spinach, nettles and…here it comes…bacon. I hesitated as I was typing it. I hesitated as I was sending it. And I kept on thinking about it. I used to be vegetarian – for a short while even vegan – until I got pregnant. Since then meat has been a fairly frequent ingredient on my plate, but for the last 1,5 years I’m having increasing difficulties in justifying my choice to myself. “But I only buy biological meat.” is what my reasoning begins with, which is sort of fine for my physical body, but not for the animal. I’m into homesteading, and was daydreaming about a time in the future when we’d raise our own animals in happiness and harmony, also for the meat (whoever thought Mother Nature is only hatching chicken and birthing female goats has to re-think their logic). But then the reality-check struck: our three chicken ‘retired’, they stopped laying eggs. Last spring I was determined to bring them to a kind butcher (?) in the next village. I had my plan ready, only needed to check with the butcher and put the chicken in a transport box when…Martha, the oldest of them, looked me deep in the eyes and communicated: ” You filthy betraying human you! We’ve served you for years and now that we aren’t producing eggs anymore you want to end our lives!” I was surprised, shocked and ashamed. I instantly replied with my heartfelt apologies and promised (yes, promised) they’d have a sweet retirement and wouldn’t have to worry about me being dangerous to them ever again. Since then we’ve been good friends again. So, back to the kitchen then. Milling over this ethical problem, I finally came to my present conclusion that the only way eating meat would be OK is if our bodies are signalling that we really need it, and we pray to the spirit of the family of a species (say, the Deer Spirit, or the Rabbit Spirit) and then go hunting and wait until an animal of that species presents itself as prey. And we then end its life skillfully, painlessly, quick and full of prayer and gratitude. But I’m not a forest-dwelling hunter-gatherer. The conclusion is therefore, for me, a philosophical one. There’s still meat in our fridge. I’m still arguing with myself. But week by week, month by month, we’re eating meat less frequently, and vegetables take its place in abundance. I guess everyone has to go through this thinking battle for themselves. It is my personal conclusion that eating meat is not good for our energy bodies. Animals are our brothers and sisters, fellow beings on this beautiful planet – why would we eat them?? And every now and then I’m wondering if plants suffer when we harvest them for nourishment. As long as we humans haven’t evolved to the level that we can live straight from sunlight and air, we need to eat (plants) and drink. The plants are very kindly specialized in transforming sunlight, air, water and soil into nutrients that we animals – humans included – can digest and use to revitalize our bodies. I suggest we start paying close attention to what’s on our plate, contemplating in gratitude every bite we chew and swallow… Your food is your medicine, it’s building and balancing (healing) your body. What is your connection to your food – where does it come from? How natural is it? How nourishing is it? How do you express gratitude to it? Eight years ago I envisioned this – it’s an embroidered wrapper for a book of visualisation. The deep etched dream of a healing garden has sprouted, and is now growing into reality. These mornings, when skies are dark and gray and the trees are raining leaves, I get up with a slight sigh and mumble to myself “all right, here we go again…”. But I’m not just stumbling through my days. These days, I’m listening deeply. I’m holding space for the Universe, with all senses on Nature, inner nature and the nature outside, as I go about my everyday Life. And Life responds. A master healer, whose talent and wisdom I deeply respect, watched at me practicing in class, and after a while, said: “You’ve got good hands”. Thank you, I know, and I’ll carry your words in my Heart. An appointment to meet with friends got cancelled and I had time to listen to an audio course. Grinning from ear to ear, I marveled at the lesson – the content but even, the voice; with the tiniest amount of imagination I found myself in what I thought might have been a lesson of Minerva McGonagall at Hogwarts (school of magic in Harry Potter) again. For you see, quantum logic and magic are one and the same. In meditation I felt the supportive hands of my ancestors on my shoulders, and later in the day got the urge to go for a walk in the woods. Leaning my back on a magnificent tree, I rested, first with eyes closed, then looking around. Next to my feet, a very young sapling of the common dogwood smiled at me, beaming with joy (how can a plant smile, it hasn’t got a mouth? It’s energy, my dear, energy). And it dawned to me – at last! – this is the plant I should work with in my living structure-project I’ve been thinking about! 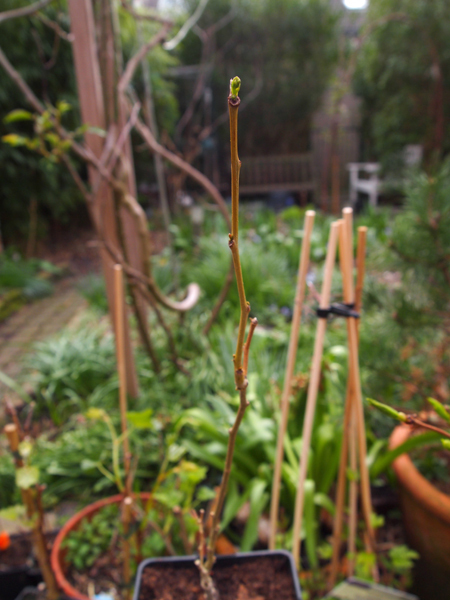 I explained my plan to the sapling (it already knew) and carefully I pulled it up and carried it home. Now it’s happily sitting in a pot, waiting for the journey and re-planting. I intentionally try to organize my life so that it is not busy. So that I have time – for holding space, being still – for deep listening. Life is full of support, when you’re open to it. Tune in to flow, synchronicity and co-creation! Gratitude. I am thankful for my plant allies and want to express it with yet another batch of talismans. So I dive into my creative cabinet and return to the table with boxes and tins filled with treasures. Taking one specific plant into mind, I assemble a little handmade trinket, a talisman, a thank you-gift. One by one I create them for the fig, the grapevine and the apple tree. My husband walks by and I explain:”I’m making gifts for the trees!” “Oh yes, of course…” is his amused answer. Expressing gratitude towards another living being is an art form that I have neglected too often. Now that the heart-to-heart, soul-to-soul connection is so powerful that it is almost tangible to me, I experience the connection – and communication – between me and my plant friends as that of good human friends: warm, respectful, and of loving service. Finding my way in the Natural world has raised the question: what is our role as human in the ecosystem and spiritual community of Nature? In comparison: animals have their instinctively driven tasks of animal/plant control through feeding on other living things, they fertilize the ground with droppings and increase the dynamics of any given space by their movements. In doing so, they are a vital caretaker of their habitat. Plants absorb nutrients from the soil into their own bodies and produce oxygen and cooling shadow as well (talk about amazing!). They also enrich the soil with their waste material – fallen leaves and other dead plant parts, from roots to top. Nature spirits and elementals have a harmonizing and enlivening effect. Wherever they’re present, there is beauty and magic, vitality and joy. I’m not quite sure how they do it, but they seem to bring enhanced Life energy to wherever they dwell. And us humans? I’m not going to go into all the things we’re doing wrong at the moment, but instead I want to jump straight into what we could do right. We, humans, have the wonderful capability of making things. We can form our surroundings – clear space, build a shelter, dig a waterway, plant trees, introduce animals into a habitat and so on. My own approach to working with Nature – in my case in the ‘ordinary’ sense: I’m gardening – has been coloured by the permaculture movement: watch Nature, copy Nature and learn from Nature. This was always ‘head-work’ to me, my mind in action. Now I’ve woken up to realize that there is a deeper level to working with Nature – interspecies communication. In order to work with Nature effectively, I’ve got to open my senses to the other players in the field – the plants, animals and nature spirits. Together we can form a Natural space that provides food and shelter for all of us, works as a dynamic ecosystem and is charged with high energy and beauty. A source of health and happiness! With the human mind, creativity and technical ability, we can create forms and solutions that Nature alone can’t make. When we listen to the other players in the Nature-game and co-create we can heal the Planet. I find it challenging to be the loving gardener of two gardens – when I’m present in one, I’m absent from the other. So I forged ‘a deal’ with the nature spirits of both places: when I’m away, they run the place. I’ve been planting trees, bushes and other plants in order to create a foodforest and healing gardens. We’ve been mowing paths and cutting back brambles, moving stones around and building stairs and terraces. But all this shaping and preparing, while it’s positive and useful, is not the same thing as hanging out with your place. Just sitting around, listening to what it is saying, singing, wishing and needing. For a small degree we’ve been listening, as in listening to intuition for where certain plants should go, or how a path might curve. But building up a friendship with your place…is something deeper, more meaningful and in spiritual/energetic terms more powerful. I’m curious to see what the coming season will bring. I will bring my gifts. And I’m looking forward to lots of sitting and listening to the land, conversations with the local nature spirits and human neighbors :) , taking into account the wishes of the flora and fauna whose home it already is. To be continued. I made this medicine pouch for myself in the autumn. It is the portal-opener of (hopefully) a series of medicine pouches to come. With raw silk and thin organic cotton, it is soft, lightweight and very inviting to touch. And this one was a gift to a very good friend. My medicine bag is open at the top, hers has a cover flap with the embroidery. To make the second medicine bag I dyed some white raw silk with onion peels. I’ve done plant dyeing before (a very long time ago) and am now inspired to explore it further. 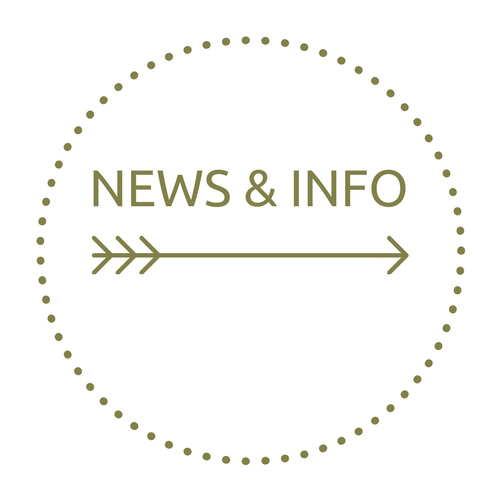 Plants – plant healing, gardening, local food, plant dyeing, swapping seeds and plants. I’m in an exciting part of my adventure at the moment! This is one of my most treasured seedlings at the moment, from seeds that I saved from my trip to Southern Spain in the Easter: the Loquat (Eriobotrya japonica). It is still safely inside,since it’s still relatively small and I’m not sure what the slugs of my garden would do with this it… It also has a friend, a smaller seedling that is growing in a loop (!). If it survives its erratic beginning, I will certainly share a pic. This season my seed-sowing passion got slightly out of hand…and I’m now dealing with the results = LOTS of treasured little plants! So with no further ado, if you’ll excuse me, I’m returning to the garden. You too, right?! Making space for new plants in the garden-to-be means cutting and digging away at bramble. While Bramble used to make me furious by clinging to my clothes and hair with its thorns and pricking in my skin in a mean way, there is now a mutual sense of understanding. 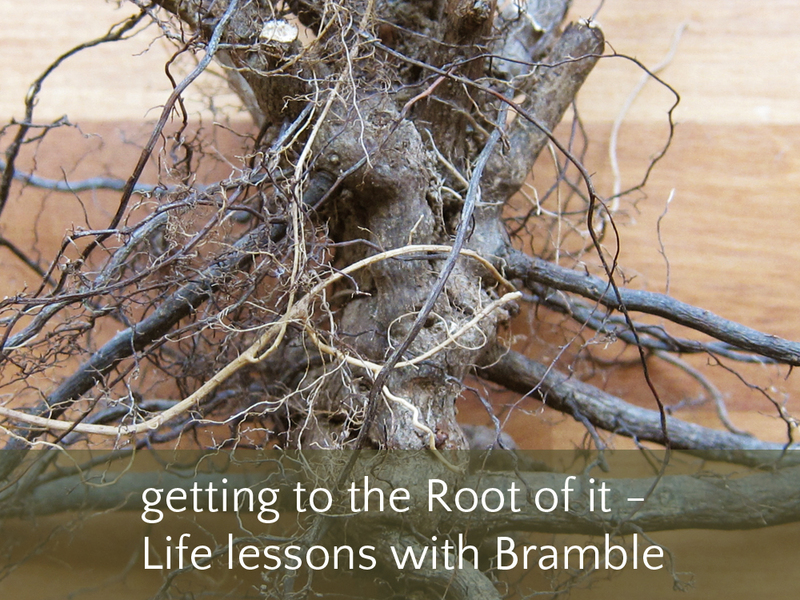 On the practical level I’ve learned to read the bramble thorns to see which end has the ‘mother root’ and which end has just rooted itself in the ground – in order to sprout more stems. I’ve also learned that I can maintain the bramble (I’d like to think: *almost* domesticate it) and enjoy juicy blackberries at the end of the summer. But there’s a deeper level to my connection with Bramble as well. I got curious about the fury I got into with my first encounter with the bramble. Where did it come from (aside from the obvious frustration and pain…)? Mutual ignorance of each others’ intentions, and we were at war with each other. But with some explaining (“I want to create a garden here”) I received a response from my thorny enemy (“I protect”). And suddenly we had established a connection by inter-species communication. I now see that the bramble protects the Earth from erosion, and it protects the animals living inside its thorny fortress from their predators. Getting to the Root of this Life lesson: connect/communicate with your living surroundings – plant, spirit or animal, humans included – and you’ll understand the magical Web of Life better. Understanding it makes you a participant, rather than a disconnected fool wasting his or her energy (as I realised by experience…). Connect, understand, participate, flow…be the co-creator of existence, together with all its other parts. During my herbalism-studies I’m always taking notes about plants I wished I had, and why. 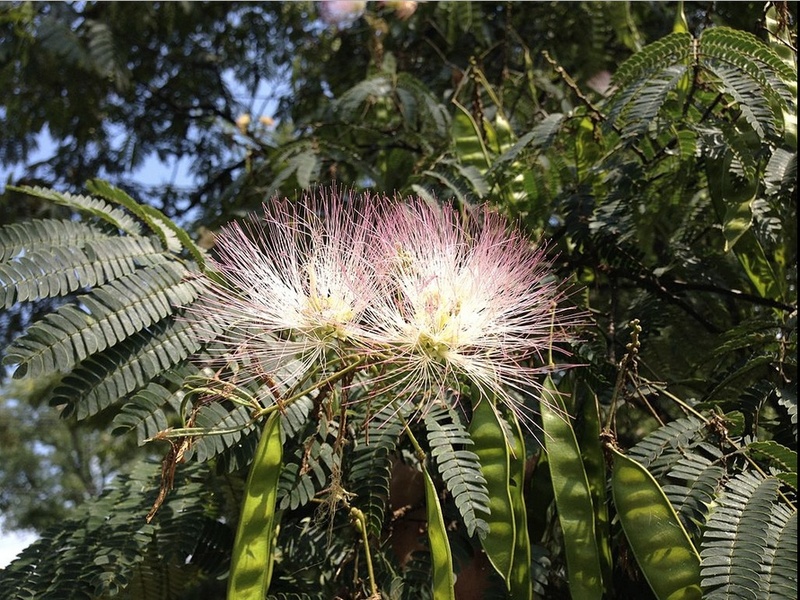 One of them was Albizia julibrissin Rosea, or the Persian Silk Tree. This plant is amazing! It is *beautiful*, it’s a great nectar tree for bees and butterflies, the seeds can be fed to livestock (I still need to check on that…) and it is medicinal (anti-depressant, sleep-inducing). It is cold tolerant (can survive temperatures down to -25 degrees Celcius) and it folds its leaves in at night – it’s common name here in the Netherlands translates as “Persian sleep-tree”. So who wouldn’t want to have such a beautiful, multi-facetted wonder tree in their garden? I do! So much that I was seeing it – with my minds’ eye – blooming and attracting bees in the healing garden, radiating its silent blessings to its immediate surroundings. I was over the moon to find it in a webshop here in the Netherlands and ordered it (along with another long-time love, Schisandra). When I unpacked it I actually asked myself “what’s this?” for a second or two before I burst into laughing – the contrast between my visualised wondertree and the young sapling I held in my hands couldn’t have been greater. What a laugh! Welcome, my dear. Please don’t quote/copy any of the content of this site without permission. Linking to social media is fine, as long as you mention Simperi! Photos made by Job de Vries (the most, and most beautiful ones) and Nina Judin (others), unless marked otherwise . The consultancies and healing sessions at Simperi are supporting the natural health of the human body. If you experience an acute problem with your physical and/or mental health, please consult your medical specialist.